WMSPanel team continues analyzing the state of streaming protocols. 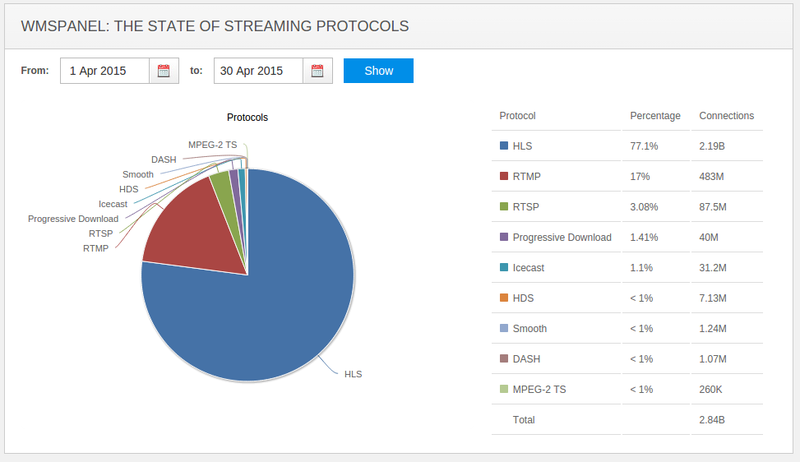 April had less views than March but the same share of protocols. HLS share is on the same level of 77% share while RTMP share (17%) went down insignificantly. Other protocols are at the same position. All these metrics calculations are based on nearly 2.9 billion views. The stats are collected from 1700+ media servers, including Wowza, Nimble Streamer, Red5, nginx-rtmp-module and Flussonic. Check the charts below. You can compare that to March stats below.